A new report reveals that 80% of patient advocacy groups are funded by pharmaceutical companies. We’re not one of them and never will be. Our long-standing independence from industry funding means we don’t ever have to choose between loyalty to our funders and taking a stand for women’s health. Will you sign up right now to support our independence with a monthly donation? Why does industry funding matter? Here’s one example: you don’t see a lot of big patient advocacy groups speaking out about the high cost of drug prices because they get money from the pharmaceutical companies making millions off our medications. Breast Cancer Action is different. We refuse funding from the pharmaceutical, biotech, and chemical industries, as well as hospitals and insurance companies, so that you can trust we’ll ALWAYS put your health front and center, without hesitation or apology. 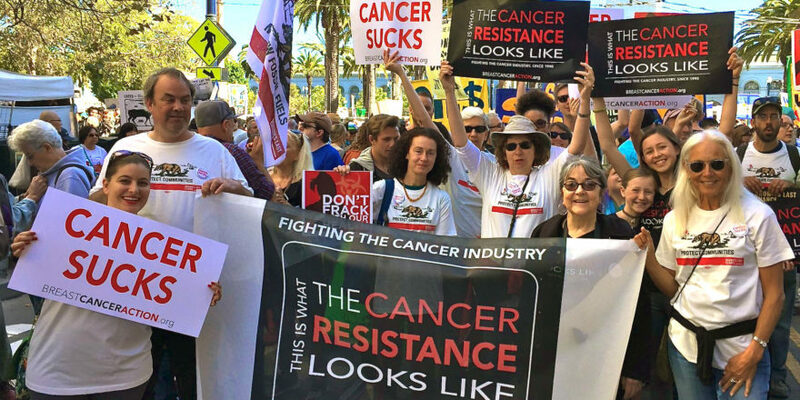 We will never be silent on the high cost of cancer drugs, unsafe or ineffective cancer treatments, environmental toxins linked to breast cancer, or any other issue critical to addressing and ending the breast cancer epidemic. Our monthly donor program is called the “Susan Stone Circle” for Susan Stone, a passionate and fierce member of our Board of Directors who died of breast cancer in 2002. Your monthly donation to Breast Cancer Action is an investment in social change, and is an important form of grassroots activism. Will you sign up for a monthly donation right now? Yes! 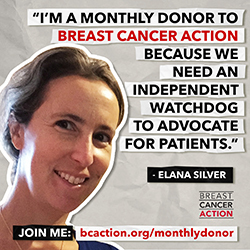 I want to help fund an independent watchdog not beholden to Big Pharma.